Horses are magnificent beasts. They just are. Their soul is right there in their eyes, and … just, wow. Right? This was my first try at drawing a horse since middle or high school, I guess. A friend and I used to sit in class and draw horses and unicorns all day (oh, and don’t forget rainbows) instead of doing classwork. I should have sketched this in pencil first, instead of going right in with the watercolor pencil, and definitely used too much burnt carmine, which looks brown until the water hits it (oops)! But you know what? I had fun painting this horse. And you know what else? I’m going to paint more of them. And draw them, too. And probably try and do some really detailed work that’s not “at the end of the workday and I gotta get it done and then post it and then blog about it” type thing, you know? They are just incredible creatures. So many shadows, so many lines. So much emotion in their faces, and in their bearing, too. I think I really just need to treat myself to some good, quality time with some horses. Some good sketching time. We have some out back, over the fence. They belong to the farm behind us. They don’t come up to the fence much. But I have a couple of friends with horses, so who knows? I may have some time to draw or paint them from life. I’m going to enjoy the journey. The color and proportion may be all wrong, but it matters not, because I enjoyed it and I’m gonna get right back on that horse, lol, and try it again! < Draw a Bird Every Month? I used to draw horses when I was young too, but also haven’t in my adult life. What a wonderful face! Looking forward to more. Wow, I’m so glad you like it! I almost didn’t post! Gotta have fun though, I’m so determined. Thanks so much for your comment this morning! Horses are so amazing. Thanks, I was a little scared to post and then I remembered it’s about FUN and shook it off lol! I’m so glad you enjoyed it! It’s good to think back to why we’re posting: to learn, to grow in ability. Turns out to be pretty good fun as well. It really is good; it’s a daily reality check! And I’ve never had a busy season sooooo relaxing as this. Man, art is medicine (way better than any pharmaceutical IMO)! It blows me away that you almost didn’t post this gorgeousness! I’m glad you took your own advice! So you were one of those horse drawers in school?!? LOL! Love it! You are such an inspiration. I’m catching the freedom fun bug! Because of you cutie! LOL! Love it! Now to work for me – and you too I am sure! Thanks FF! LOL!! FF ROCKS!!!! Hehe have fun, my sweet! Thank you! That’s just the feeling I had as I was painting it. Woo, talk about looking into the eyes of a creature and painting it. Nothing better than a horse. (Even better than Keith Urban, lol). I’m glad you enjoyed it! Would love to see some of my photos turned into drawings. Wow, thanks so much! You have some terrific photos there! So many that I can already see I’d love to try and draw. I’m so glad you like this one. I will try and do justice to your photos. Thanks so much for sharing them! Lovely horse! How about draw a blank day – as in fill in the gap to get people to draw anything they really like? Thank you! Hmm…that’s a good idea! I hope I remember this conversation once May 8 rolls around, because that’s a terrific suggestion. Birds as subjects may not speak to everyone. 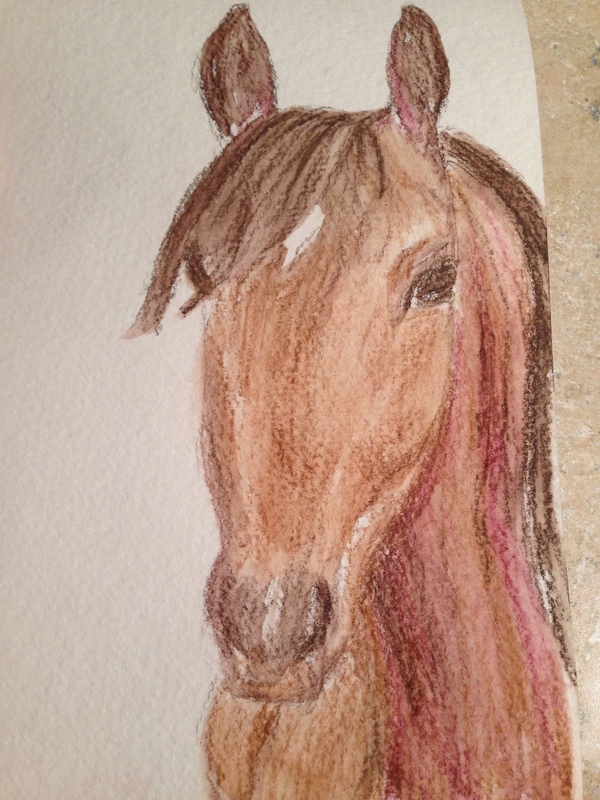 Many of my neighbors have horses, and I’ve been meaning to go out there to sketch them but haven’t found time yet. :} There may be very few little girls in North America who haven’t have tried to draw a horse or unicorn at least once in their lives…LOL! Looking forward to seeing more of your horse art! Thank you! I hope you get out there and sketch them. It’s hard to resist them, now that I’m thinking (and seeing) like an artist. Which I never thought would happen to me. It almost feels like I’m in a bit of a dream, lol…. They definitely seem like a real challenge to capture, because there is so much muscle and bone structure you can almost see, just looking at them. You really chose the equine for E, so cool!!! I had to look up the word in a dictionary, because I only knew “horse”… This is not only about getting better at drawing/painting here for me, it´s also about improving my English skills. 😊 Very nice equine, by the way!!! There should definitely be a Draw-A-Horse day, they´re such wonderful animals!!! Thank you, Ann. I see soooo much to improve, but that’s part of the fun! They really are such gorgeous animals. hehe, Equine is a great word. I live in the country, so there’s lots of horses, cows, critters around. Which I really love. I could never live in a city; it would kill my soul. LOL, I thought about a unicorn for the last U, but Keith Urban’s eyes told another tale 🙂 and I was dying to try him again anyway after getting his face crooked the last time lol. Thanks, I’m glad you enjoyed it, Jill. I would really like to get it better. I did enjoy doing it though, so it’s all good. Oh wow, this is beautiful. Love the colors and the way you drew the horse’s expression. I used to take horseback riding lessons when I was a kid, and you’re right, they’re amazing creatures. I’m glad you shared this! Thank you! I can’t wait for a redo. They’re quite a challenge to capture. Way harder than people IMO. Excellent first attempt at drawing a horse. Such a great colour! I bet you’ll do a marvelous job with their large, expressive eyes and their proud, graceful necks with some practice. Life drawing of horses sounds like an interesting challenge. Cool that you live so close to some. The thing about having a blog is that it prods us TO DO something every day. I need that prodding or maybe I’d be lazy. Love seeing your works and witnessing your progress…you are inspiring to so many. What a nice thing to say! Thank you very much. I really appreciate that. So many have inspired me and I’m grateful to be able to spread some of that around.